Bitcoin exchange platform BTCC has announced the launch of Bitcoin Chips that comes in six denominations ranging from 1,000 bits to 500,000 bits with notable Six Color Signature Set. According to the announcement, the Set consists of one chip from each Bitcoin Chip denomination adding up to six chips, with matching serial numbers. These chips can be ordered by customers’ in configurations of one to a few chips each, or in bulk rolls of 20 chips each. 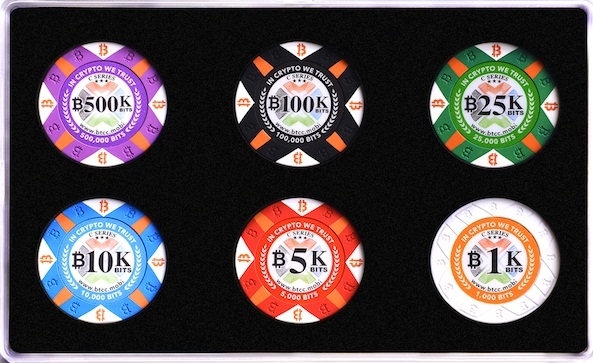 The six different denominations, each with different color that are made from premium composite, consist of purple – 500K-bit (0.5 bitcoin) chip, black – 100K-bit (0.1 bitcoin) chip, green – 25K-bit (0.025 bitcoin) chip, blue – 10K-bit (0.01 bitcoin) chip, red – 5K-bit (0.005 bitcoin) chip and white – 1K-bit (0.001 bitcoin) chip. “Bitcoin Chips are attractive and durable collectibles that are perfect for introducing your friends and relatives to bitcoin or starting your own physical bitcoin collection. We made Bitcoin Chips to make bitcoin accessible to everyone by presenting it in physical form,” Bobby Lee, BTCC’s chief executive officer said. The move follows the launch of BTCC Mint, the physical coins with digital currency inside them, which is created with pure titanium, making it lightweight, durable, and sleek. The release was intended to celebrate BTCC’s completion of five years of successful operation. Earlier in July, BTCC released new series of titanium collectibles - physical bitcoins each containing an entire Bitcoin Block. The key highlight of the Bitcoin Chips is its premium design that contains detail from the outer part of the BTCC flower logo interspersed with the bitcoin symbol. The Chips also has strong security and anti-counterfeiting features that provide customers with peace of mind that their investment is secure and genuine. The hologram sticker on the reverse of each chip consists of a polyester round that has a private key with its QR code. This can be scanned to import each chip's bitcoins into any online wallet that supports the bitcoin private key format.